Plenty of options for your activities for day and night (night excursions are among the most popular). Kayaking and swimming in the lake lodge's lake is a popular daytime activity. Our 30 meter scaffolding canopy tower gives you spectacular views of the vast expanses of standing forest. 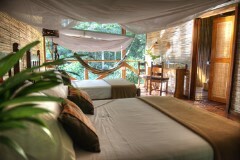 *Refugio Amazonas Lodge also offers shorter and longer stays are also available. Contact us for more information. Upon arrival from Lima or Cusco Airport, you will be met by a representative from Refugio Amazonas, and transferred to Tambopata River Port. You will embark on a two hour boat ride to Refugio Amazonas and will pass by the Community of Inferno and Tambopata's National Reserve's checkpoint. After checking in to your room, join a welcome briefing presented by the lodge manager. 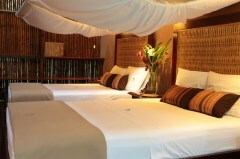 Spend the afternoon at your leisure before a hearty dinner followed by an option to go for a night walking. This is when most of the mammals are active but also a little difficult to see. Search for frogs with shapes and sounds that are as bizzare as their natural histories. After breakfast, your first visit will be to the Oxbow Lakes. These lakes is an important and distinct habitat found in the Amazon basin. Many of the lakeside wildlife such as hoatzin, caiman, and hornerd screamers are also easy to watch and thus make great photography subjects for folks on a family eco-vacation. Paddle around the calm waters in a canoe or catamaran and look for lakeside wildlife such as hoatzin, caiman, and hornered screamers. You will hope to see the otters which are infrequently seen here. Be rewarded with overhead sightings of macaws! 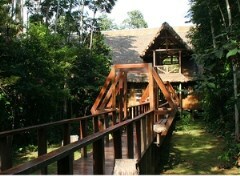 Your next activity comes after a thirty minute walk from the lodge, a 25m scaffolding canopy tower. From the upper levels of the tower, your guide will be scanning for monkeys, toucans, parrots, and other canopy dwellers and will show them to you with a spotting scope. The tower is an excellent place to see flocks of screeching parrots and parakeets fly by at eye level. After lunch, stop by a farm that is situated in the riverside community of "Condenado". Here, the owner of the farm will show you how he cultivates Amazonian crops such as Manioc, Cocona, Copuazu, Plaintains, and other fruits, in a sustainable manner. Along this trail, you will also find a variety of plants and trees that are used by the local population with at least the same variety of purposes. Learn about the medicinal (and other) uses of Ajo-Sacha, Yuca de Venado, Uña de Gato, Charcot-Sacha, Para-Para, among several others. After dinner, there will be nightly lectures prepared by the staff at the lodge to cover important conservation threats, opportunities and projects in the Tambopata National Reserve. A fifteen minute boat ride and sixty minute walk from Refugio Amazonas is a clay lick used both by parrots and parakeets. 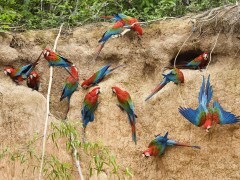 You will see parrots and parakeets descend on most clear days to ingest the clay on a bank. Species such as Dusky headed and Cobalt winged Parakeet descend at this clay lick. With luck, you will also see some or all of the following species in the early morning rush: Mealy and Yellow-crowned Amazons, Blue-headed Pionus, Severe macaw and Orange-cheeled (Barraband`s) Parrot. After lunch, go for a walk along a Nut Trail and learn all about how the seeds from this important tree are harvested and used to make food and other sustainable products. Guests will even get the chance to take part in a bit of Brazil Nut harvesting themselves and can have a crack at opening some of these extremely hard nuts back at the lodge for a fun, challenging family green travel activity. Later on, visit a mammal clay lick where you can observe wild rainforest pigs show up in herds of five to twenty individuals to eat clay in the late morning. Chances of spotting them are around 15%, but well worth the short hike. 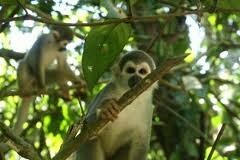 Other wildlife also shows up including deer, guan and parakeets. Refugio Amazonas Lodge offers a range of activities that are available at an additional cost for Guests choosing the Classic Program. For the A La Carte Program, Guests have the choice of 4 activities per day. For a detailed list of excursions, please contact us.